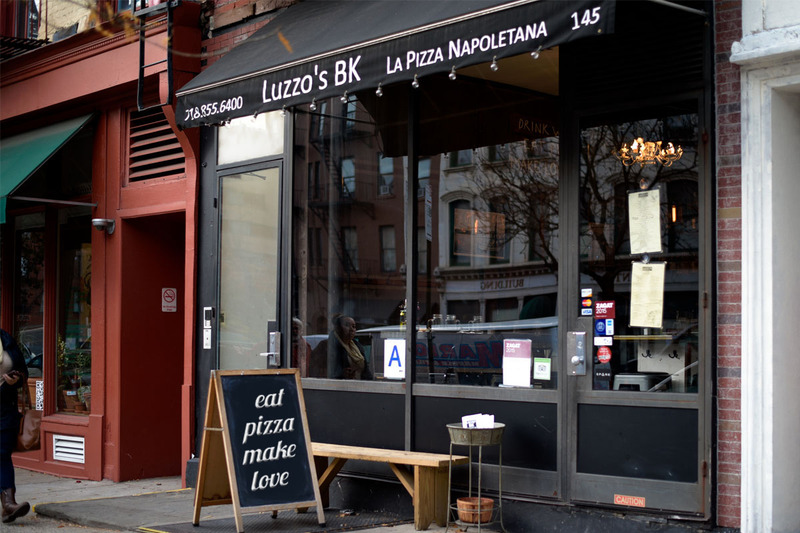 #eatpizzamakelove is the handle that Luzzo’s BK pizza lives (or loves) by. 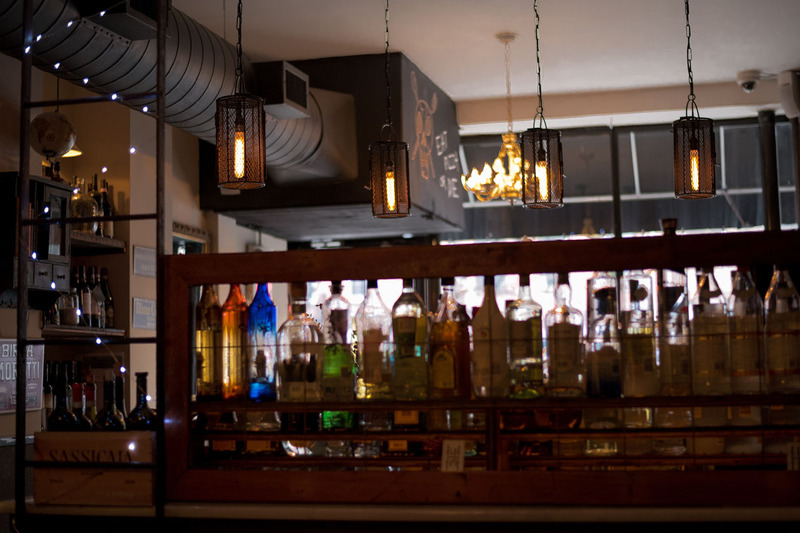 The secret to their basic award winning neapolitan style pizza – topped with wonderful D.O.P. 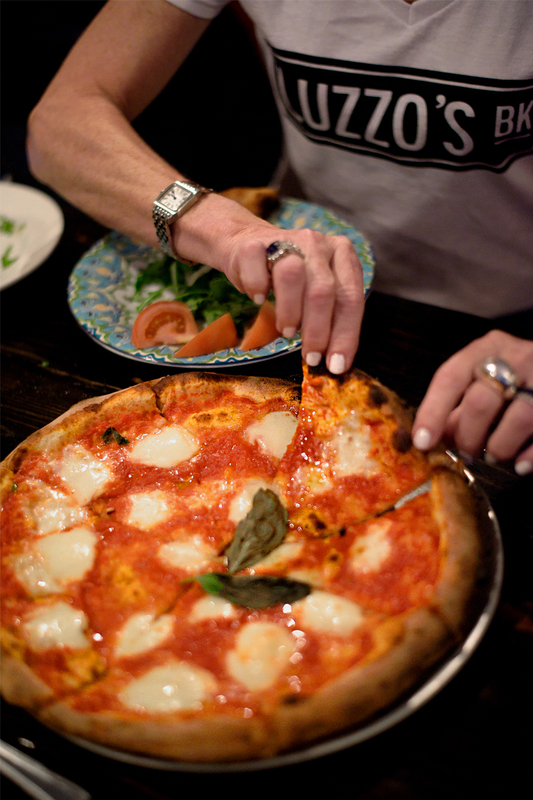 buffalo mozzarella and house made fresh tomato sauce is safe with them. 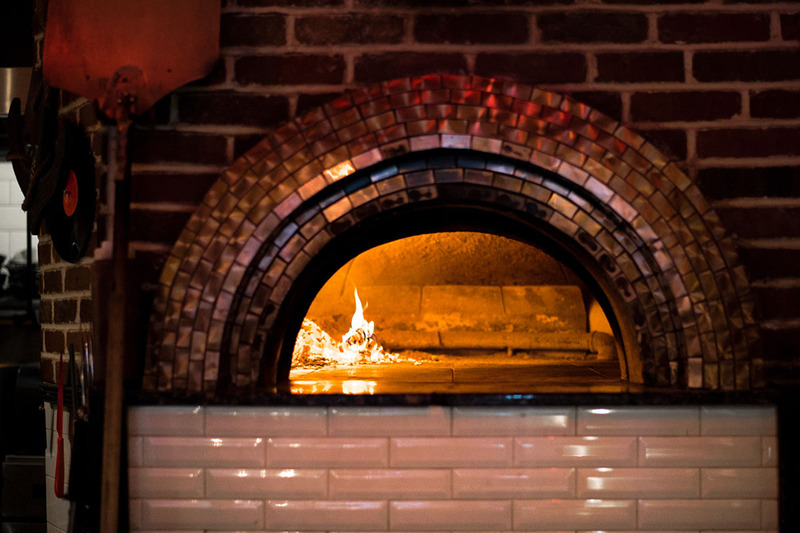 It is of no great concern exactly how they make such delicious, stand out pizza, in a wood burning oven, in an open air kitchen – so long as they keep on making it, the way that they do, with the pure pizza deliciousness that is bestowed upon even the most discerning pizza aficionado. Along with the very favorite pizza margherita, there’s also a full menu of antipasti, and pastas, but this is a pizza joint, so while the aforementioned entrees are delicious, nothing can compare to the small or large chewy crusted, blistered edges with dollops of hot cheesy delight, fresh basil and tomato sauced pies. Before the pizza, though, a Leggera salad is a serious recommendation. 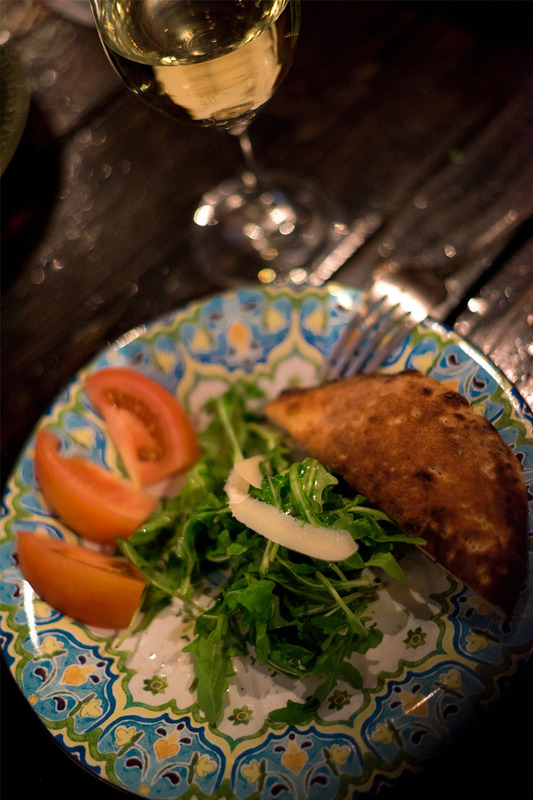 With a simple toss of baby arugula, san Marzano tomatoes and then drizzled with a tasty lemon vinaigrette dressing, a serious salad is born. Mussels, eggplant, artichokes are a few other items ordered from time to time, but the pizza is what we all keep coming back for and they certainly deliver. In their house and, really ‘speedy gonzalez’ now – to your house. And when they get there, one of the Gonzalez delivery men will speak broken Italian English with a Spanish accent. (You simply cannot make this stuff up, it’s true.) So with the motor bike delivery being another Brooklyn Heights trend, these mexitalianamericans can get from their restaurant on Atlantic Avenue to your kitchen while the cheese is still oozing and the pizza dough is still piping hot. Very handy indeed, especially since they serve throughout the day which has proven to be a miracle during a snow storm. “Buona sera!” says it all. 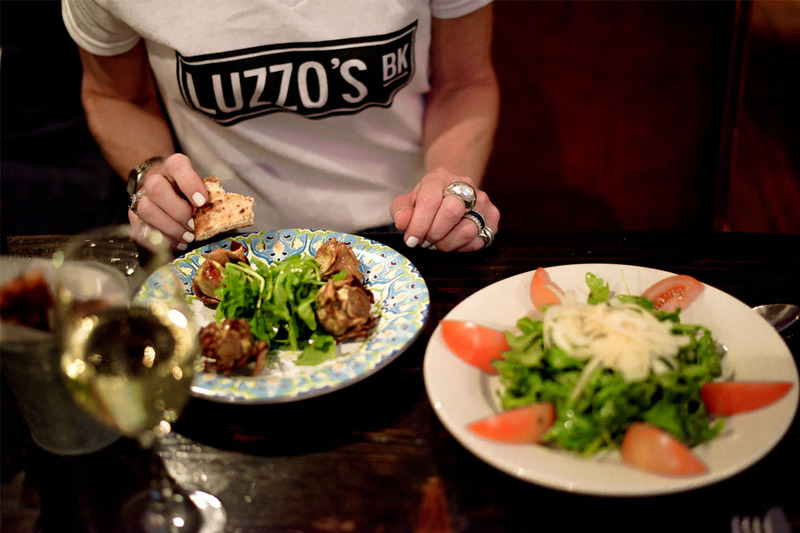 And they do say that a lot at Luzzo’s BK. 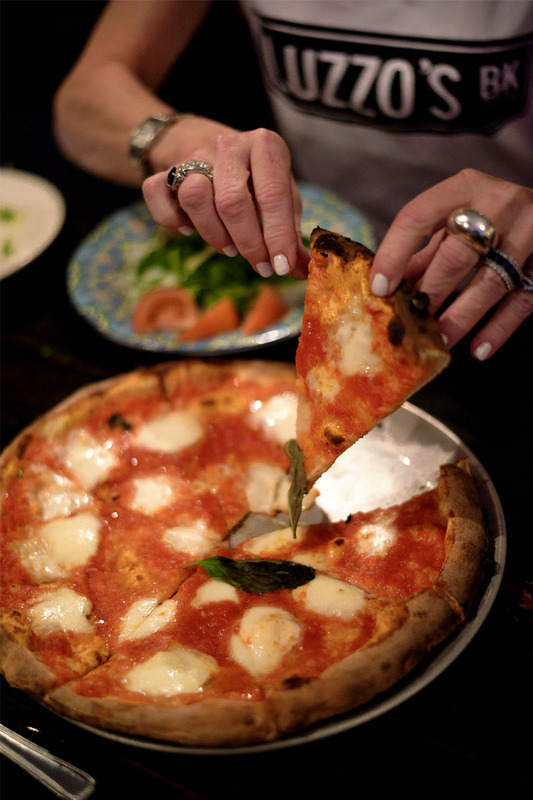 The fact that it is spoken with so much sincerity from everyone (including the huge amount of Italian speaking customers, and the bike riding worker bees) in this petite pizza joint, adds to the small southern Italian village-like charm. 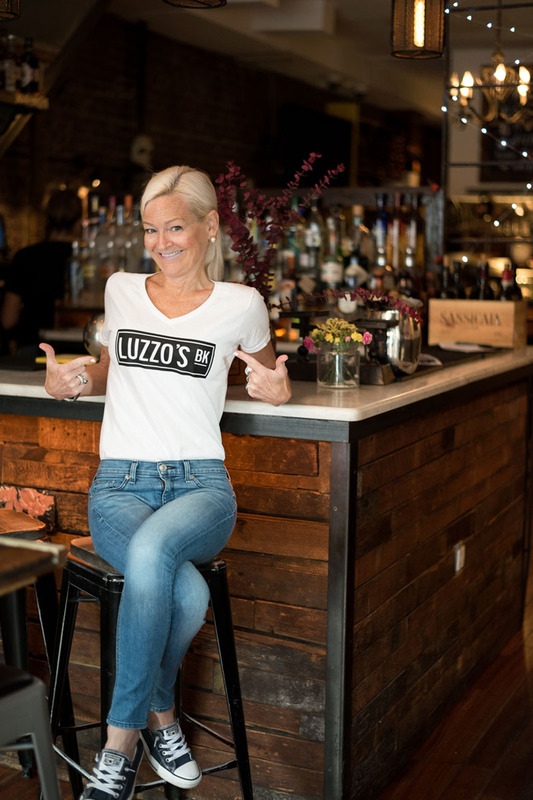 The staff is another reason they have so many regulars, as everyone is made to feel at home at this cute and yummy Brooklyn pizzeria outpost. 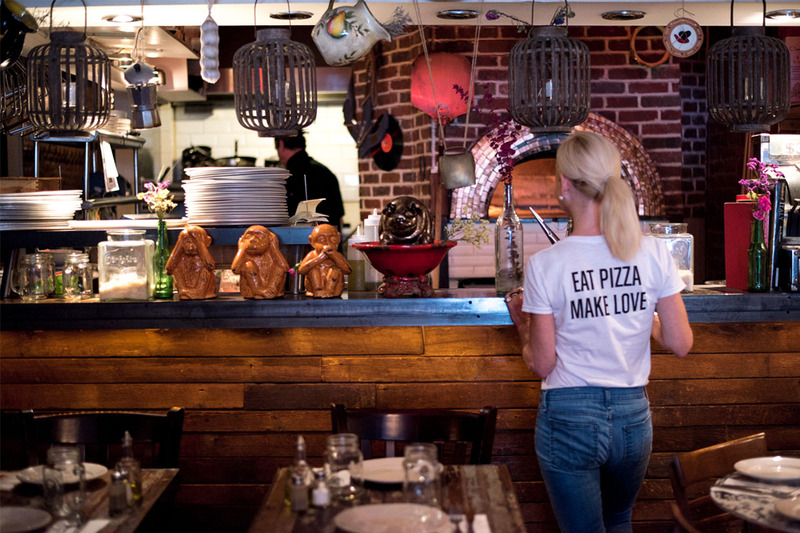 A pleasant surprise, the #eatpizzamakelove t-shirt was given to me as a gift – not that I ever need a reminder to eat pizza. Since this is #nationalpizzaday (the gig will be up with these self-named days, soon, I’m sure) it seemed the perfect opportunity to show it off. 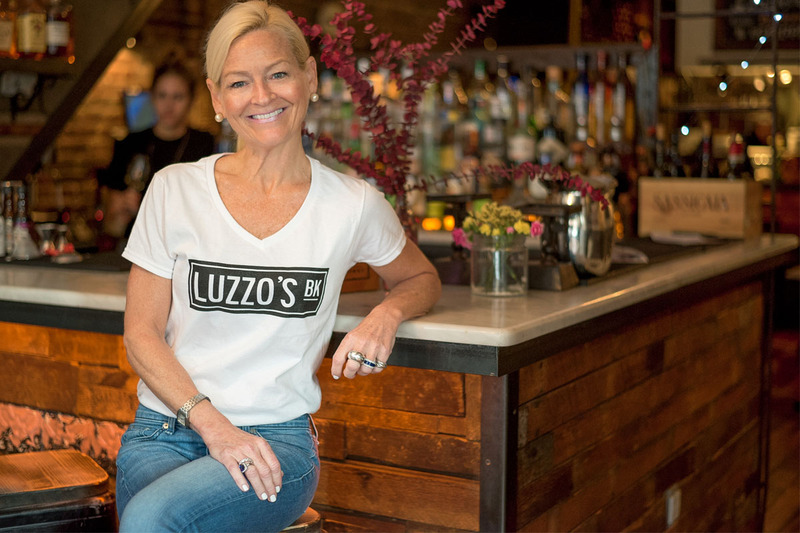 It is actually a joy to show off Luzzo’s BK for any reason. It’s that good.